On Cheese Board maze, rodents begin the experiment into the starting box. The Cheese Board test consists of evaluating a distance traveled and time spent to find all three rewards into 3 of 177 holes per trial. Rodents are tested on how it is going to consider and investigate spatial learning memory on the Cheese board apparatus. During learning trials, animals learn where rewards are located and after rest, researcher test whether the animal recalls these rewards location. Our Cheese board is a circular maze with 177 holes. We use a circular infrared light for this test to get the best nose detection and our software VideoTrack. 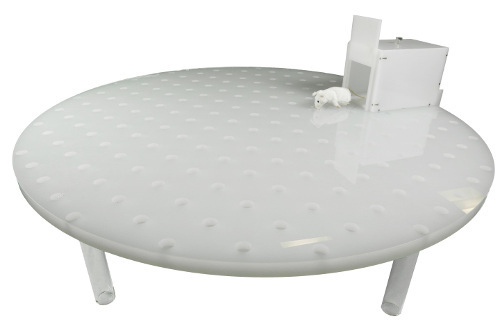 The Cheese board is available in white or transparent in 30 mm of thickness. The Cheese board is also available in black in 20 mm of thickness.